My second card in the ABC Christmas challenge for February is made for "D is for decorations". 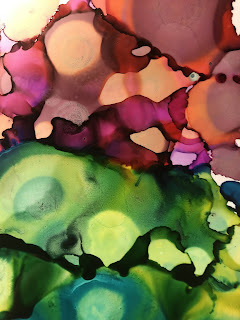 I used drop technique, alcohol inks on yupo paper. Then I put some peel off stickers on the paper and cut out the Christmas baubles. And then some metallic spotted background paper. This was quite a quick card! And luckily I had enough colored yupo for two cards. And then I found some foiled paper I liked even more. Which one is your favorite? I think I’ll enter Fab’n funky’s challenge with this one, they’re up for a Christmas challenge too this week. 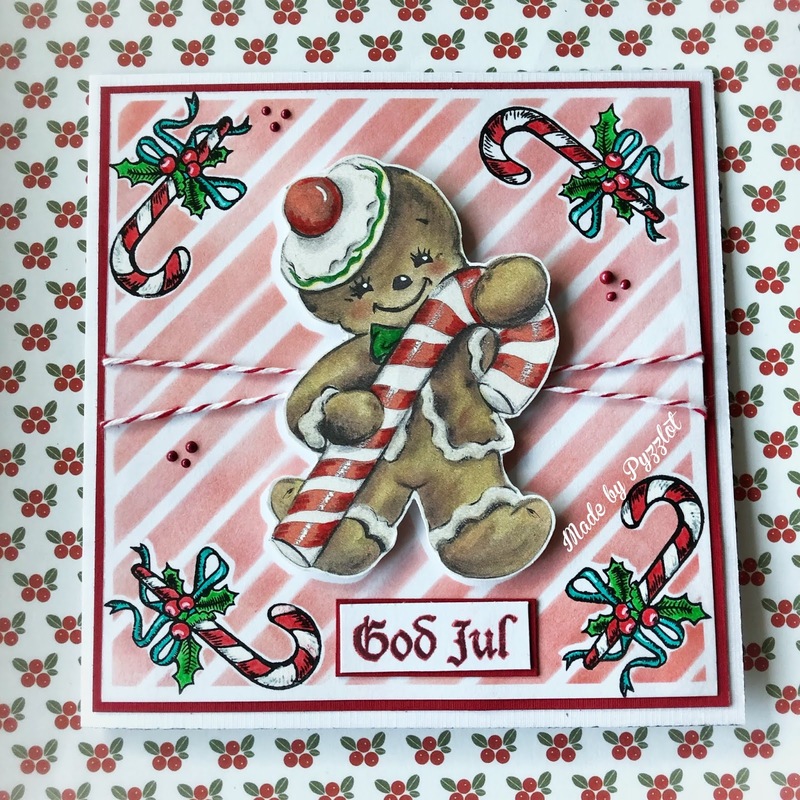 If you participate in ABC Christmas challenge each month you’ll have fun AND a stash of cards prepared in time for next Christmas. Hence a very good idea! Here’s my card for February "C is for Candy". 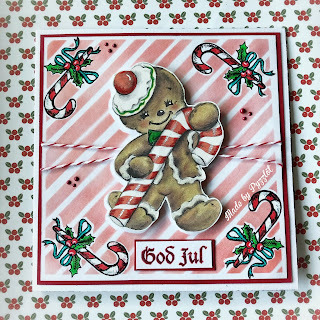 I cut out a Gingerbread man from a topper and made the background using a stencil and Distress Oxides "Candide Apple", after masking in the candy cane stamp. Distressdynor (Oxides eller Inks), stämplar och stenciler. Så lyder ingredienserna i mitt favoritrecept på hur man gör ett vackert kort och njuter under processen. Varför? Jo för att hela processen börjar med ett vitt orört papper. Jag finner en enorm tjusning i det. Idag tänkte jag använda dessa saker från Instila och berätta hur jag gör. Jag börjar med att färglägga motivet med Distress oxides med vattenpensel enligt bilden nedan. De små detaljerna färglägger jag med akvarelpennorna när motivet är torrt. Sedan gör jag bakgrunden med hjälp av appliceringsverktyget och stenciler. För blommorna använder jag Nuvos embellishment mousse. Den är krämig att smeta på i stencilen och ger en fin lyster. Bakgrunden ramar jag in med cardstock i lila och vitt. Sedan fäster jag blomman med 3Dkuddar i mitten av motivet och gör samma sak med hälsningsfrasen som jag stämplar och ramar in. Jag är själv född i februari och februaris månadssten är ametist – en lila-skiftande sten. Kanske är det därför jag tänker att det här kortet blir bra till ett februaribarn. Hoppas du blev inspirerad och plockar upp något till dina framtida projekt! Berätta gärna för oss i så fall. Frozen at Valentine? Well, this will warm your heart! Penguins and butterflies... The scrapbooking world is full of them. And I sure understand why. They are my favourite too. The penguin stamp I used on this card is yet another old one from my deep in my stash. It is a swedish design, made by Skaparkällarn, Pernilla Nilsson. I colored with Prima water color pencils. I love how the red balloon stands out from the picture. I think this card is perfect as a Valentine card. I made the background with Distress oxides and splashed some water drops on it with my hand and drying it off with a paper to get the speckled snowy look. With this card I enter weekly challenge at CASology. This time themed to"Frozen". Hope you like it and got some ideas for your next project. It was a long time ago I had my box with Penny Black stamp. Every time I do however I fall as much in love with the old favourites as with my newer ones. 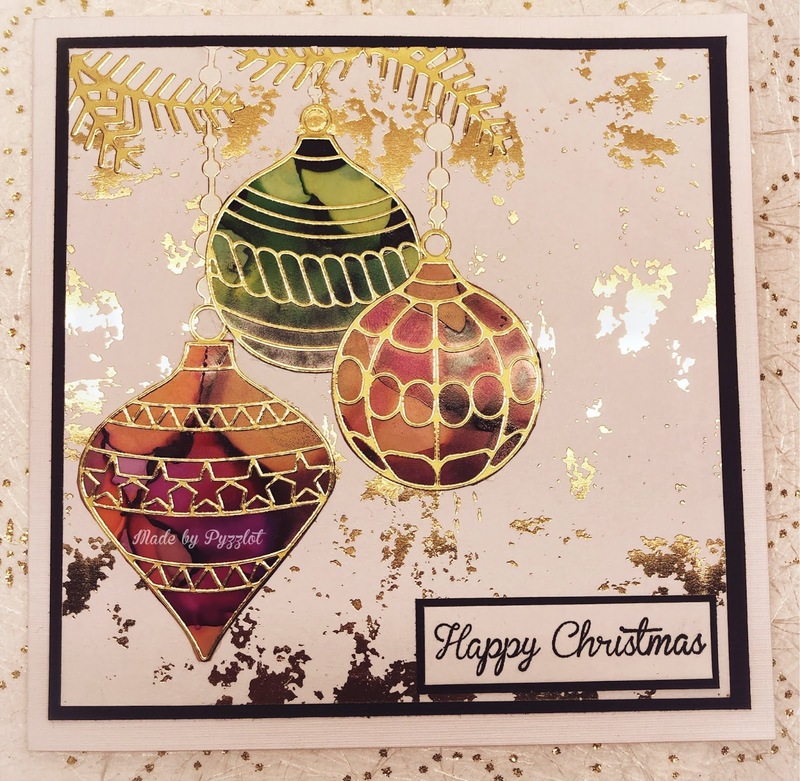 For this card I used stamps from to different stamp sets. The whole colouring, both background and stamp motif are made with Distress Oxides. The card is made after a sketch in AAA Cards Game #131 - Sketch + Pastel Colors. As soon as I saw it I knew I wanted to use the Friends-die and color the background and the letters the same and stamp some texture on the letters. After that I looked for stamps that would go well with the coloring and the friend-theme. I finished it off with the birthday wish and with adding white contours around the letters using a Posca pen. I used the holly and the berry from a Hero arts stamp set I bought a couple of years back. The texts are from the same stamp set. It is stamped with color from Distress Oxides. 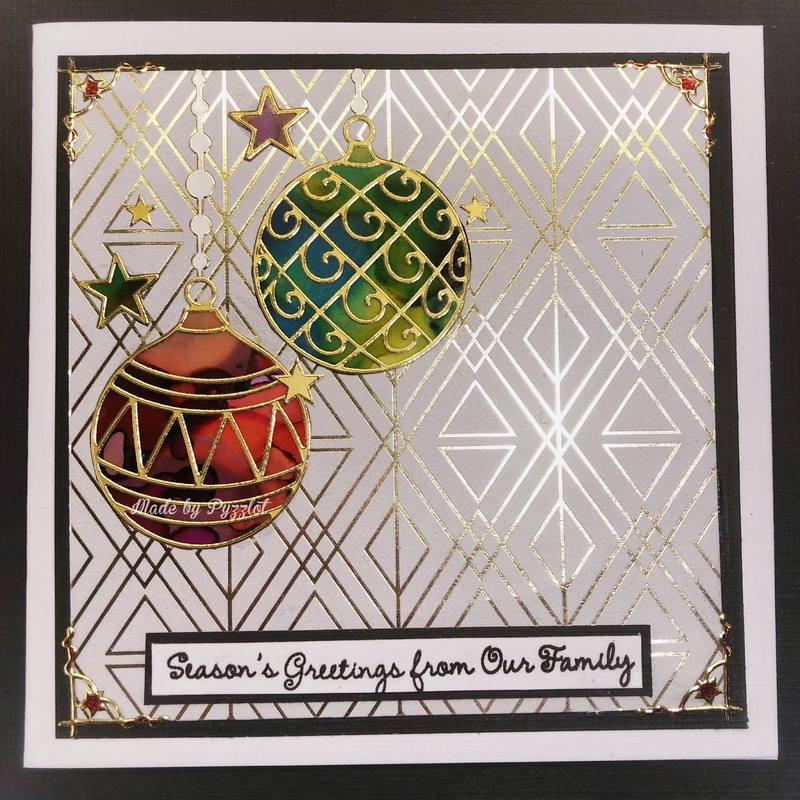 I made the back with Distress ink and used the Nellies choice stencil "Swirls 2". Then I dug deep and used the very first Penny Black stamps I bought "Holly day Critters" it's called with this cute little fellow. I put them him on 3D dots to make him stand out from the background. And well I couldn't help using some Nuvo Chrystal drops to finish it off. With these two cards I realise I already made 10 Christmas cards in January. Well that's kind of a good start!! A big reason for the continous production are these fun challenges. One of them monthly challenges has a alphabetic theme, two letters each month; ABC Christmas Challenge. Great idea and inspiration. Here are my card for A. B is coming up as a separate post otherwise the linking will be messy. I used my new Nuvo Shimmer powder in green and Solar Flare and Green parade to create the background to imitate northern lights. Then I used the beautiful stamp from Studio Light and the textstamp from Craft Emotions. I sprinkled som Embossing powder Frantage from Stampendous over it to create a snowy feeling. I smudged the ground a bit around the animals using a white art crayon. I didn't want the line from the background to be so sharp there. 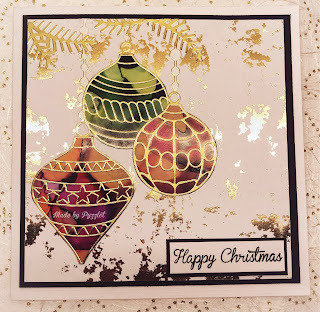 I used a strip of embossed paper from the pine folder from Leane Creatief embossing folder.